Just Cause 4’s release is nearly upon us. To celebrate the franchise’s latest entry starring Rico Rodriquez, Square Enix has released a launch trailer. As with every other trailer for the impending title, chaos sits center stage. Get a look at just how crazy things will get in Just Cause 4’s official launch trailer. While short, the launch trailer perfectly encapsulates everything fans have come to enjoy about Just Cause’s prioritization of high-octane action. Rico glides through explosions in a wing-suit with ease, rides a massive oil tank that barrels through grassy plains, and weaves through traffic in a sports car like he’s auditioning for the next Fast and Furious sequel. To an extent, none of this is new territory for the long-running Just Cause series. New to the franchise, however, are deeply integrated customization options. With Rico’s upgraded grapple, players will have the option to customize the character’s capabilities to their liking. Boosters, tethers, and air lifters are at the basis of these upgrades, all of which feature “tunable parameters.” As such, there are countless possibilities for how Rico’s loadout can be altered. 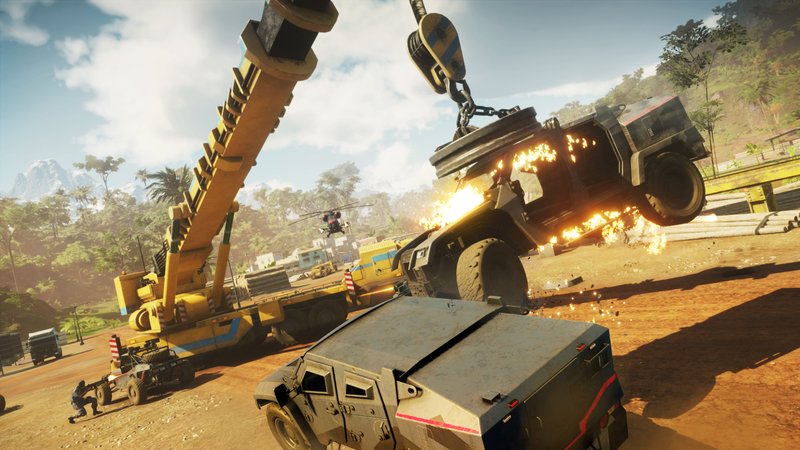 Some of the upgrades were recently shown off in a gameplay demo, featuring footage from the PlayStation 4 Pro version of Just Cause 4. Amid the chaos rests a story as well, one involving Rico’s quest for answers about his father’s death. It’s a journey that leads him to the South American country of Solís, whose landscape is heavily inspired by real world locales such as the Andes and Argentina. Just Cause fans can get their hands on another adventure when the fourth entry launches on December 4, 2018.